Browse our informative articles on horse care and treatment written by EDV vet members as published in top equine publications. 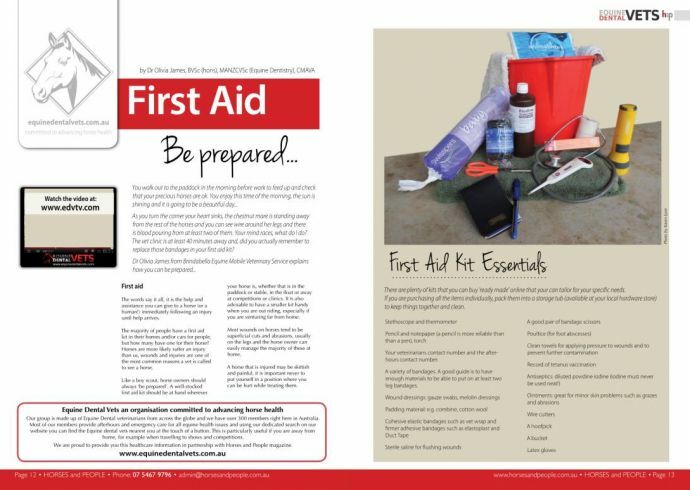 replace those bandages in your first aid kit? Proper regular dental care is important for all horses, regardless of age size or use - just like it is in humans. As well a making for a happier, healthier horse, the benefits provided by proper dental care include being able to maximise the FCR or Feed Conversion Ratio. 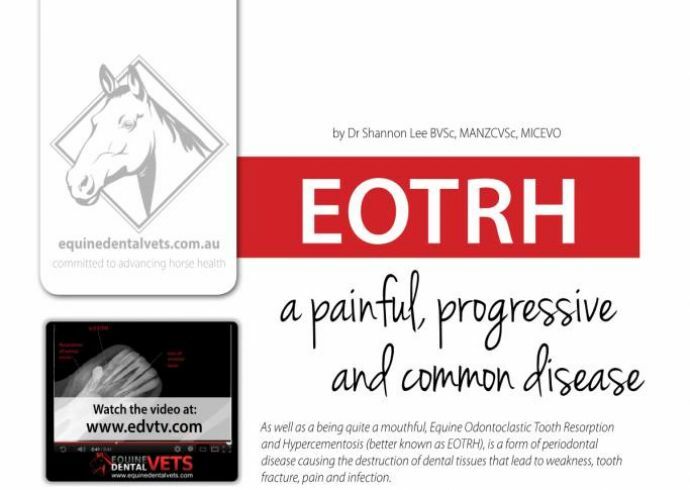 As well as a being quite a mouthful, Equine Odontoclastic Tooth Resorption and Hypercementosis (better known as EOTRH), is a form of periodontal disease causing the destruction of dental tissues that lead to weakness, tooth fracture, pain and infection. Back in 2007, Dr Shannon Lee from Advanced Equine Dentistry, diagnosed the first cases in Australia. 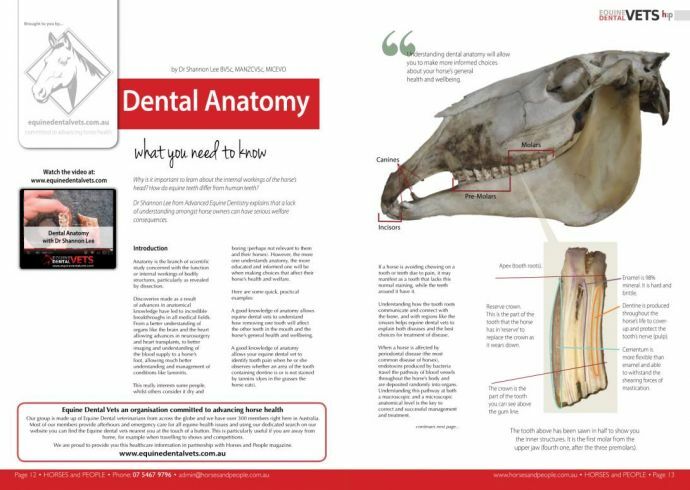 Here he explains about what is a common yet poorly understood progressive disease that, at present, has no cure and requires expert treatment and management from your Equine Dental Vet. From minatures to draft breeds, working stallions require dental examinations and dental care to identify and treat dental disease. 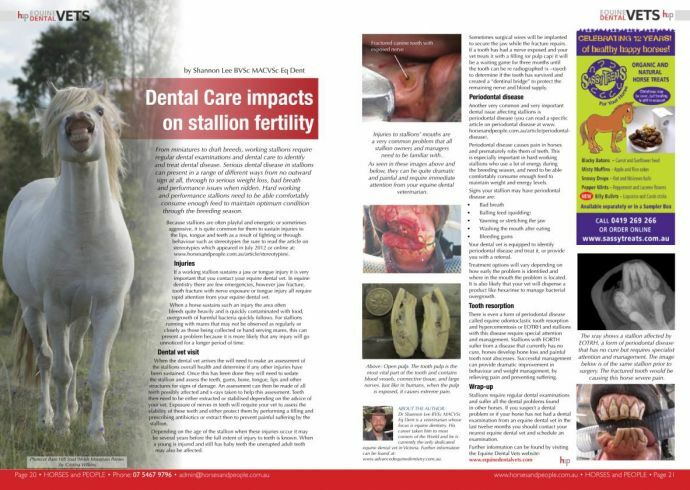 Serious dental disease in stallions can present in a range of different ways from no outward sign at all, through to serious weight loss, bad breath and performance issues when ridden. Hard working and performance stallions need to be able comfortably consume enough feed to maintain optimum condition through the breeding season. Intestinal worms are present in all horse, pony, donkey and mule populations worldwide, and are considered the major health problem of these species. 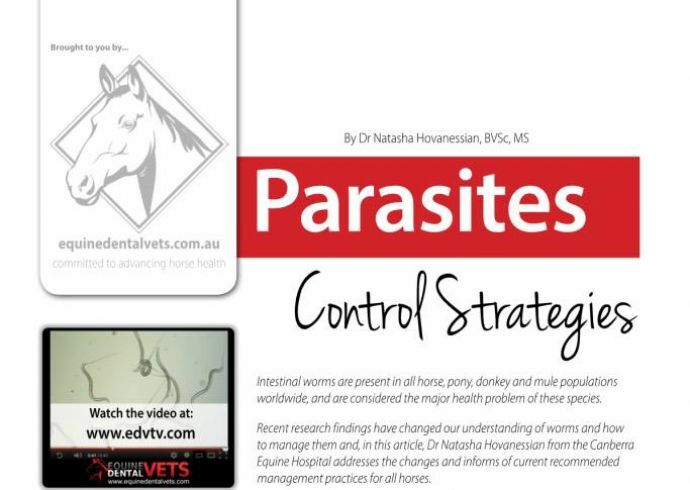 Recent research findings have changed our understanding of worms and how to manage them and, in this article, Dr Natasha Hovanessian from the Canberra Equine Hospital addresses the changes and informs of current recommended management practices for all horses. 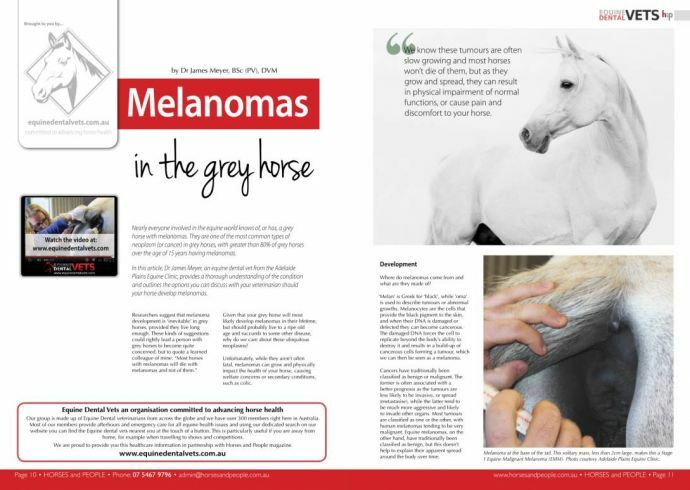 Nearly everyone involved in the equine world knows of, or has, a grey horse with melanomas. They are one of the most common types of neoplasm (or cancer) in grey horses, with greater than 80% of grey horses over the age of 15 years having melanomas. 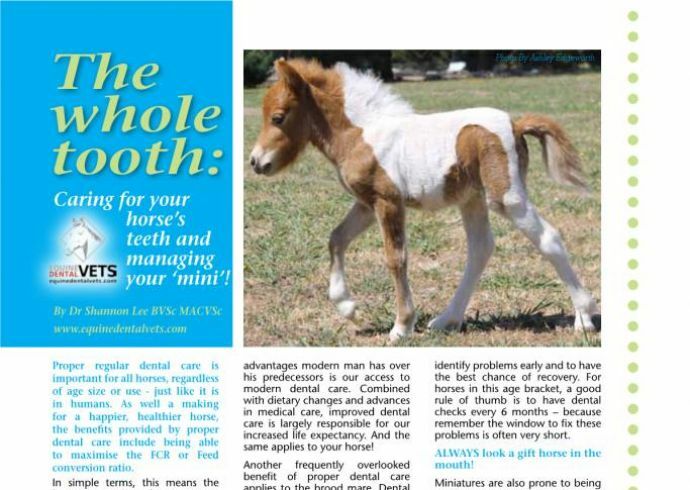 In this article, Dr James Meyer, an equine dental vet from the Adelaide Plains Equine Clinic, provides a thorough understanding of the condition and outlines the options you can discuss with your veterinarian should your horse develop melanomas. 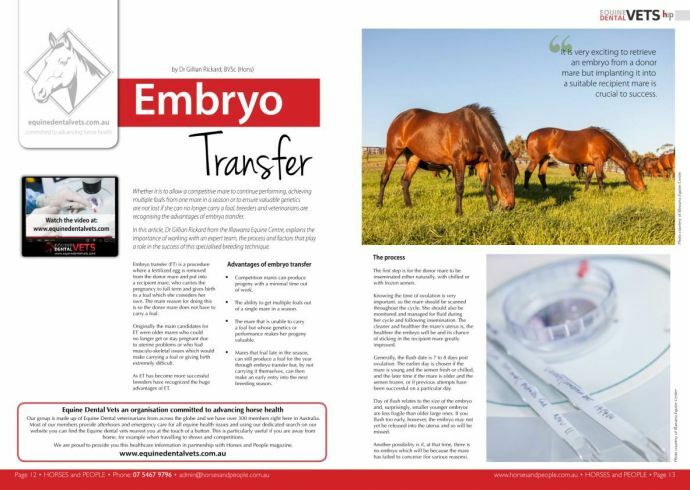 Whether it is to allow a competitive mare to continue performing, achieving multiple foals from one mare in a season or to ensure valuable genetics are not lost if she can no longer carry a foal, breeders and veterinarians are recognising the advantages of embryo transfer. In this article, Dr Gillian Rickard from the Illawarra Equine Centre, explains the importance of working with an expert team, the process and factors that play a role in the success of this specialised breeding technique. 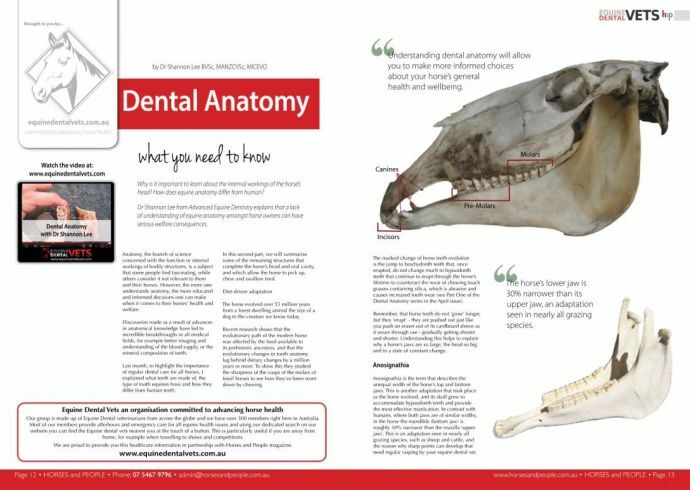 Part 2 of the EDV series of articles focusing on Equine Dental Anatomy. Why is it important to learn about the internal workings of the horse's head? How do equine teeth differ from human teeth? Dr Shannon Lee from Advanced Equine Dentistry explains that a lack of understanding amongst horse owners can have serious welfare consequences. Why is it important to learn about the internal workings of the horse's head? How do equine teeth differ from human teeth? Dr Shannon Lee from Advanced Equine Dentistry explains that a lack of understanding amongst horse owners can have serious welfare consequences. 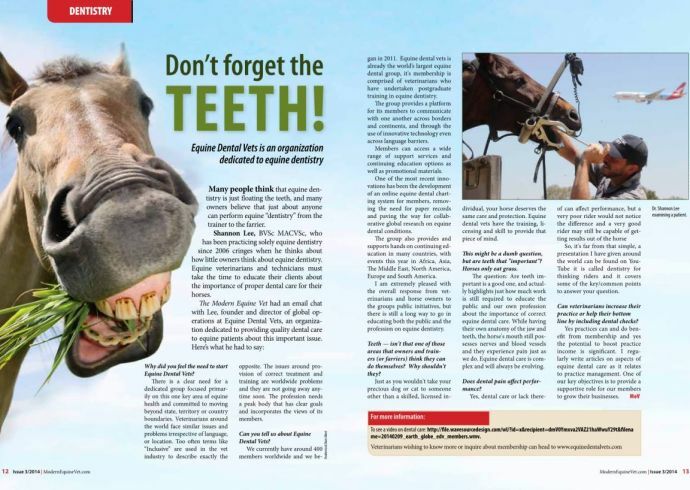 Many people think that equine dentistry is just floating the teeth, and many owners believe that just about anyone can perform equine "dentistry", from the trainer to the farrier. Shannon Lee, BVSc MACVSc, who has been practicing solely equine dentistry since 2006, cringes when he thinks about how little owners think about equine dentistry.